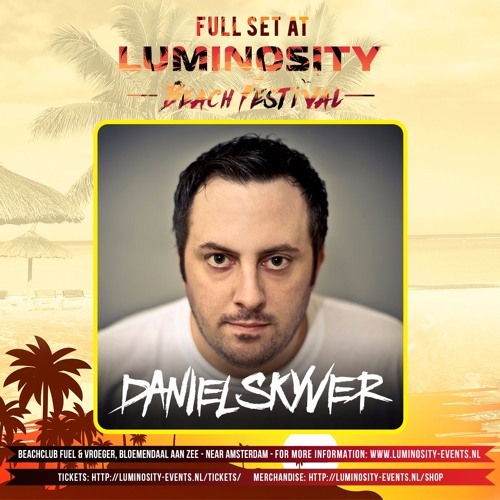 FULL SET recorded LIVE at Luminosity Beach Festival 2017 Stage Copacabana Beach 23-06-2017 Bloemendaal aan Zee, The Netherlands Luminosity Beach Festival 2018 tickets are now available: www.luminosity-events.nl/LBF18 Tracklisting: 01. The Chemical Brothers - Hey Boy Hey Girl (Tasso bootleg) (Skyver Edit) - White Label. 02. Stoneface & Terminal - North Cape - FSOE. 03. ID 04. Kansai - Rococco - Platipus. 05. Alan Morris feat Ellie Lawson - Find Myself In Losing In You - Amsterdam Trance. 06. James Dymond - Maze Runners - FSOE. 07. Alex Di Stefano - What's The Catch - Kearnage. 08. ID 09. Randy Katana - Fancy Fair (Daniel Skyver remix) - White Label. 10. ID. 11. Mike Squillo - 8 Chambers (Syntouch remix) (Skyver Edit) - Trance All-Stars. 12. Solar Factor - Urban Shakedown (Daniel Skyver bootleg) - White Label. 13. Miss Shiva - Dreams (ID remix) - ID Label. 14. ID 15. Above & Beyond - Far From In Love (A&B San Fran mix) - Anjunabeats.